Here is a hat I created after looking at a blanket design I fell in love with. I changed my design a bit but I really like how it came out. 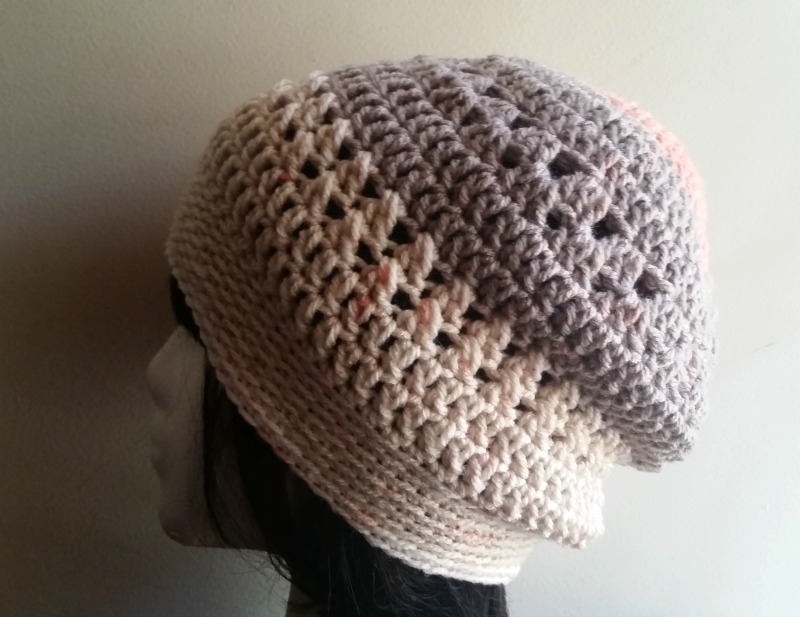 It is a nice slouch and sure to be a staple in your own wardrobe. While I made it so that you can use with Caron Cakes yarn; however, just follow the gauge to use your favorite yarn. Some additional notes: I am a loose crocheter, so please make sure to check your gauge or go up a hook size if you crochet tight. Also, this hat can be increased/decreased by using a number divisible by 3. Round 8 Ch 2, 2 dc in same stitch, skip 2 stitches,* 3 dc in next stitch, skip 2 stitches*, repeat from * around. Sl st in ch 2. Round 9 Sl st in next 2 stitches, ch 2 in the space, 2 dc in same space, *3 dc in next space, repeat from * around. Sl st in ch 2. Round 11 Repeat round 10. Round 12 Ch 2, cdc (please review the special stitch instructions) around. There will be 1 dc left to end the round. Sl st in ch 2. Round 13 Repeat round 12. Round 14 - 15 Repeat round 10. Round 17 - 23 Ch 1 and sc blo in same stitch, sc blo in each stitch around. Sl st in sc. Weave in ends and fasten off. Thanks so much for the freebie!! Beautiful work!! I think round 13 is an error because it would repeat round 2 which 2 DCs in every stitch around, thus it'd be far greater than 66 dc/sc at the end. Ohh good looking out! That should be repeat Round 12 :) Thanks! Oh crap! I gotta frog some. I knew it didn't look right, haha. Np! Glad I could help out! Love your patterns!